Asheville, a picturesque city in the Blue Ridge Mountains of western North Carolina, is famous for its eclectic citizenry. 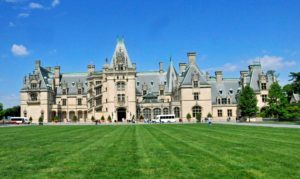 A popular tee shirt proclaims, “If you’re too weird for Asheville, you’re too weird.” The Biltmore Estate, Asheville’s most popular tourist attraction, epitomizes the ostentatious materialism many of its residents seek to avoid. George Washington Vanderbilt II was the grandson of Cornelius Vanderbilt, who made a huge fortune in railroads and steam boats. As a young man, George became fond of Asheville, then a small mountain town. When his father died in 1885, George decided to use his inheritance to build a summer house near Asheville. For what he described as his “little mountain escape,” he assembled a 125,000-acre site south of town from about 700 individual parcels, many of them wooded. He named the property the Biltmore Estate in honor of Bildt, his family’s ancestral village in Holland. George Vanderbilt began building his house in 1889. When completed six years later, the house had 250 rooms occupying more than four acres of floor space. The Châteauesque exterior is constructed of Indiana limestone, but most of the furnishings and interior elements originated in Europe. With 35 bedrooms and 43 bathrooms, the house remains the largest in the United States, about four times the size of the White House. In the early 1900s, faced with increased costs of maintaining his estate, George sold 87,000 acres of land to the United States for use as a national forest. During the Depression, the Vanderbilt family opened the Biltmore Estate to the public, hoping tourists would come to hard-hit Asheville. The idea worked. Visitors soon began arriving from around the world, some deciding to stay. Today, the Biltmore Estate draws about 1.5 million visitors annually and George Vanderbilt’s descendants employ more than a thousand of Asheville’s delightful residents.